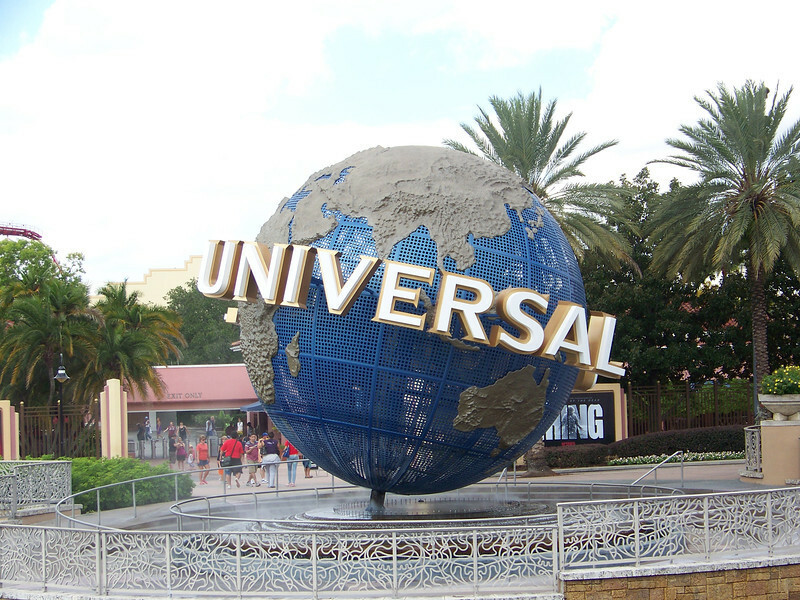 Welcome to the Universal Orlando Resort! 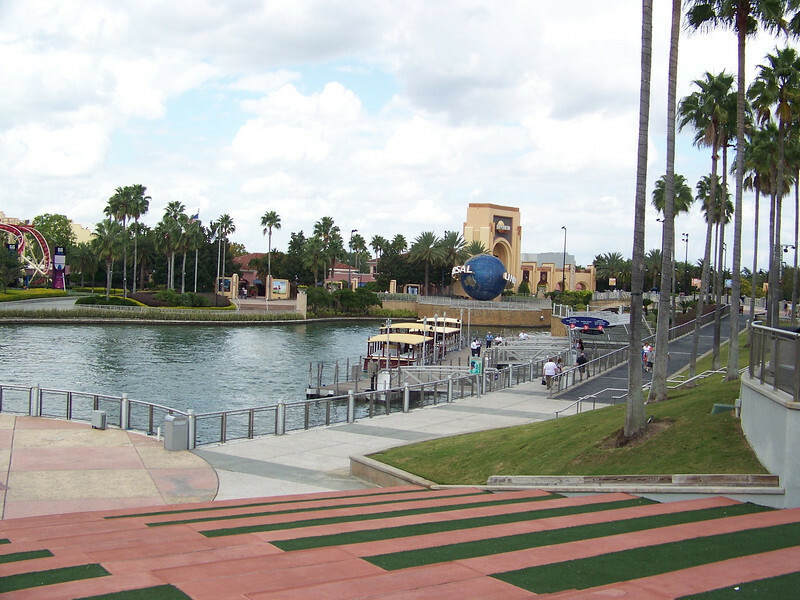 After parking the car in a huge garage and walking through the shops and restaurants of Universal CityWalk, we arrived at this small lake. 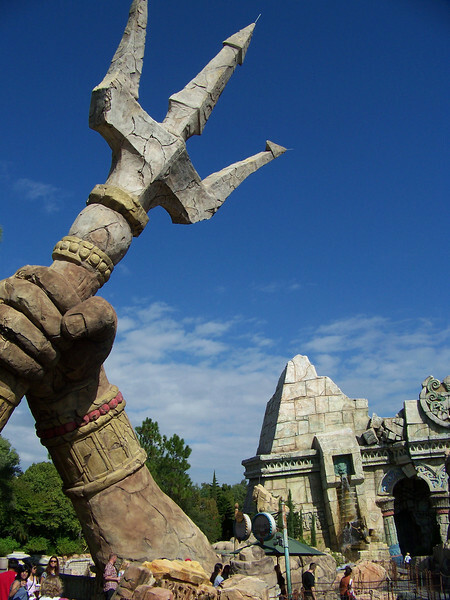 The entrances to the two theme parks were on either side of the lake. 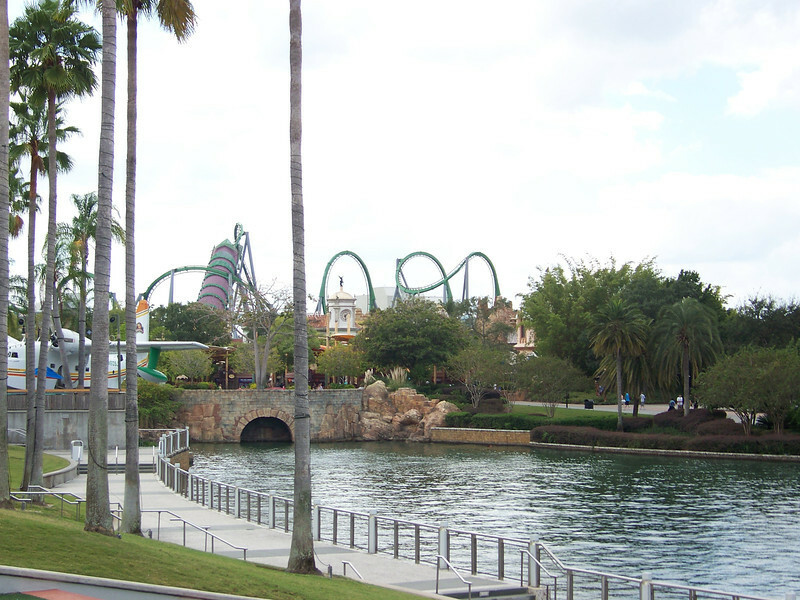 To the right, you can see the entrance to the original Universal Studios Florida (we'll go there later in the day). 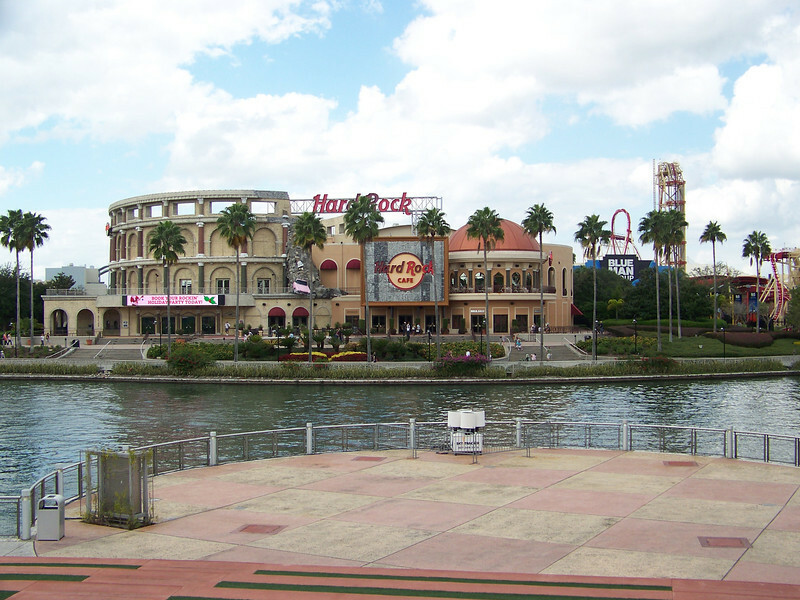 Directly across the lake is more of Universal CityWalk, which was full of shops and restaurants that anyone could access without an admission charge. To the far left of the lake was our first destination. The icon for this park is the Pharos lighthouse, which was right at the entrance. We arrived at the crack of dawn (okay, it was like 8:45 am). This was the crowd waiting for the gates to open at 9 am. 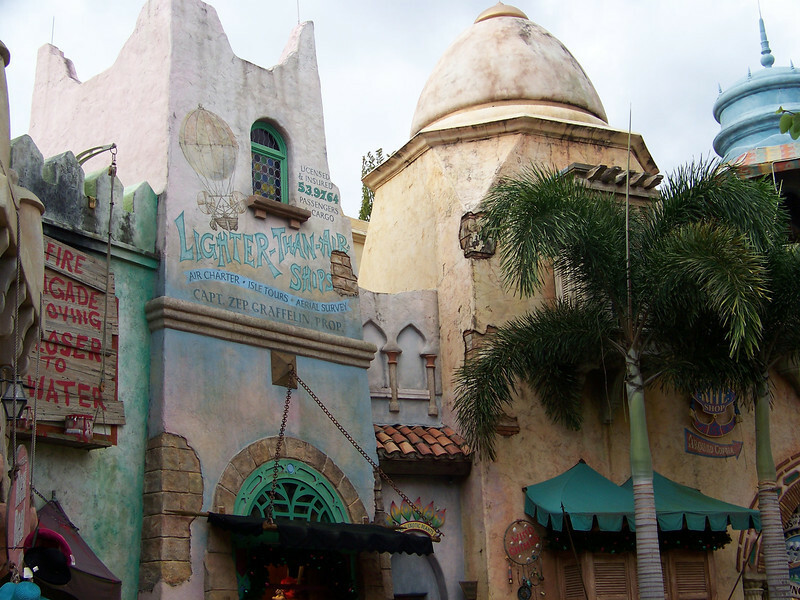 The first part of the park (their Main Street, if you will) was called Port of Entry. 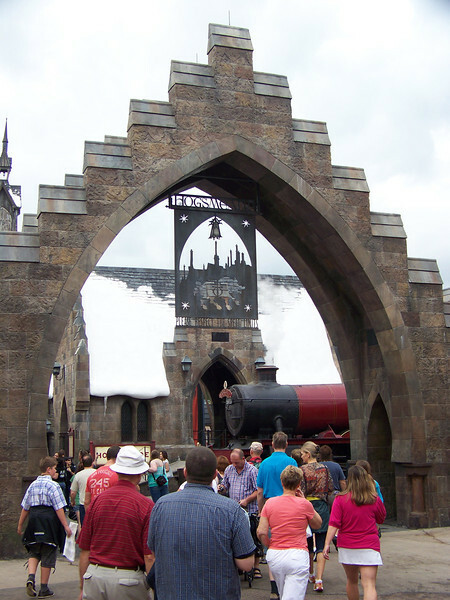 You walked under this bridge just beyond the turnstiles, and "The adventure begins!" This area was filled with shops and guest services. 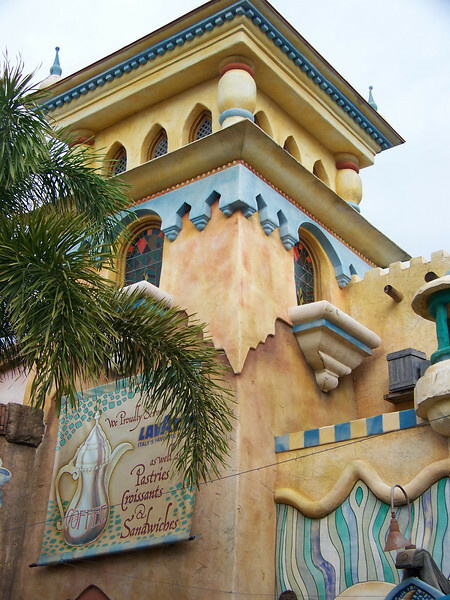 It featured "fantasy exotic" architecture that wasn't meant to represent any real place or time. 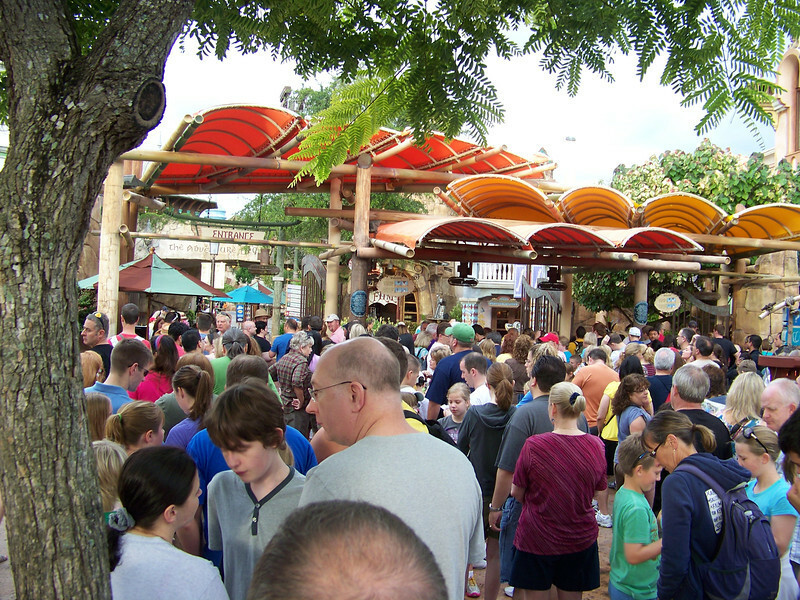 We passed through the Port of Entry area quickly and made a beeline with the rest of the earlybirds to the Harry Potter section of the park. On our way to Harry, we passed through another land (or "island," as they're known here) called "The Lost Continent." 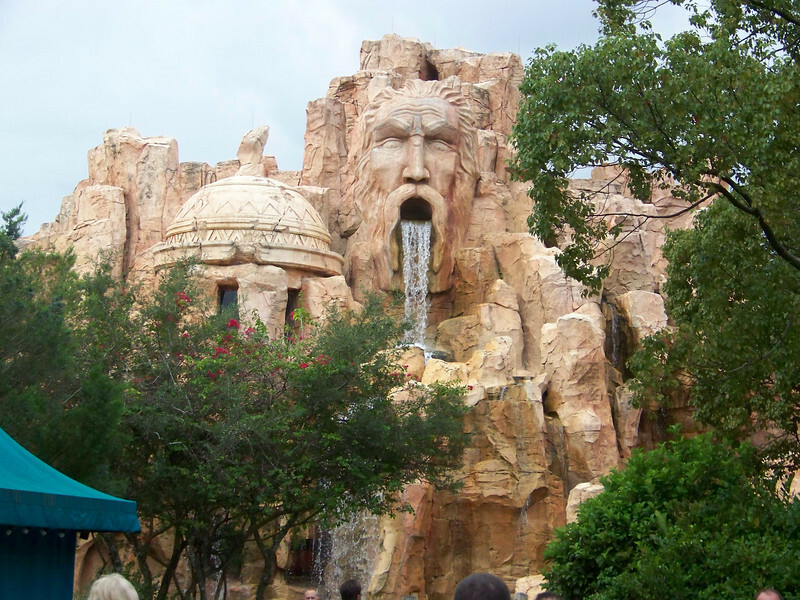 This is the exterior of a nice table-service restaurant called Mythos. I've never been myself, but I've read good things about this place online and I hope to eat here someday. Much of this area's real estate was given over to Harry Potter. 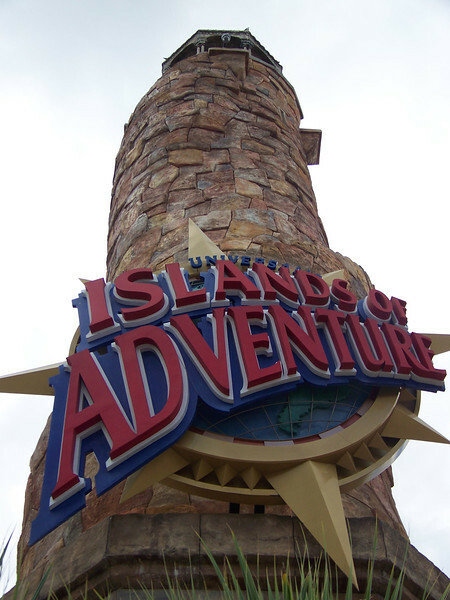 In fact, two of the roller coasters that were once part of this island were re-themed and are now part of Potterville (though they didn't actually move). 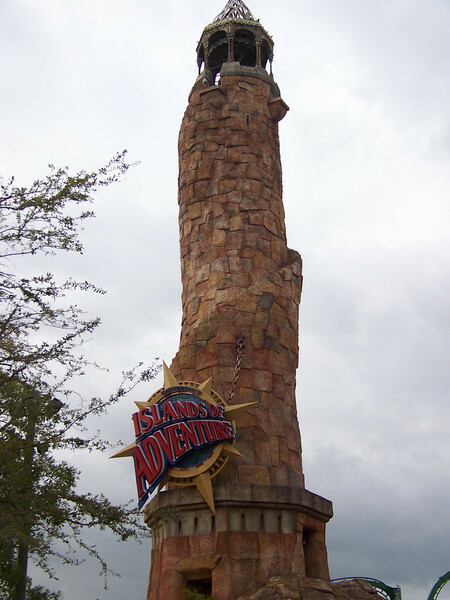 On our previous visit, we saw both Poseidon's Fury (a "special-effects adventure") and the live "Eighth Voyage of Sinbad Stunt Show" in this island. However, we didn't do anything here this time. Success! We made it to the entrance of Harry's realm. 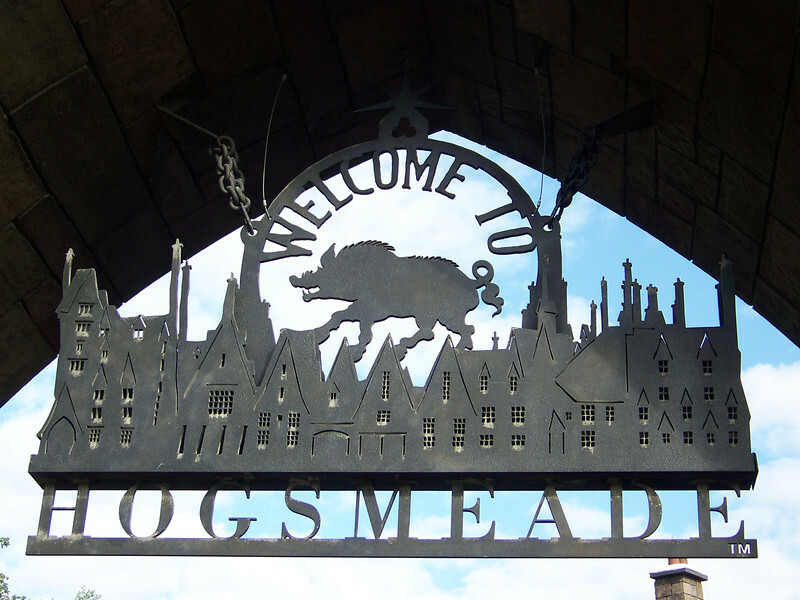 We arrived at Hogsmeade, the village near Hogwarts School of Witchcraft and Wizardry. 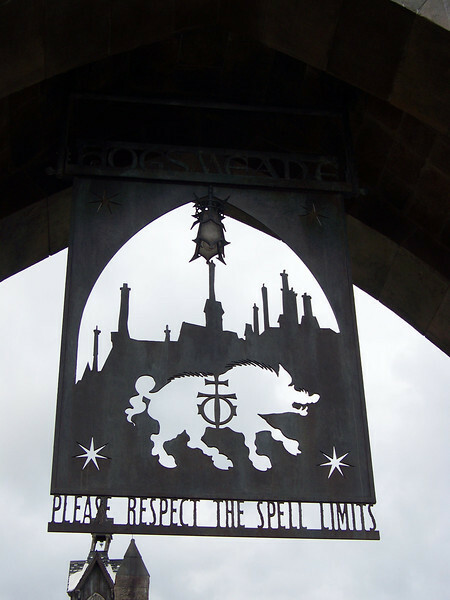 Please respect the spell limits while in Hogsmeade. 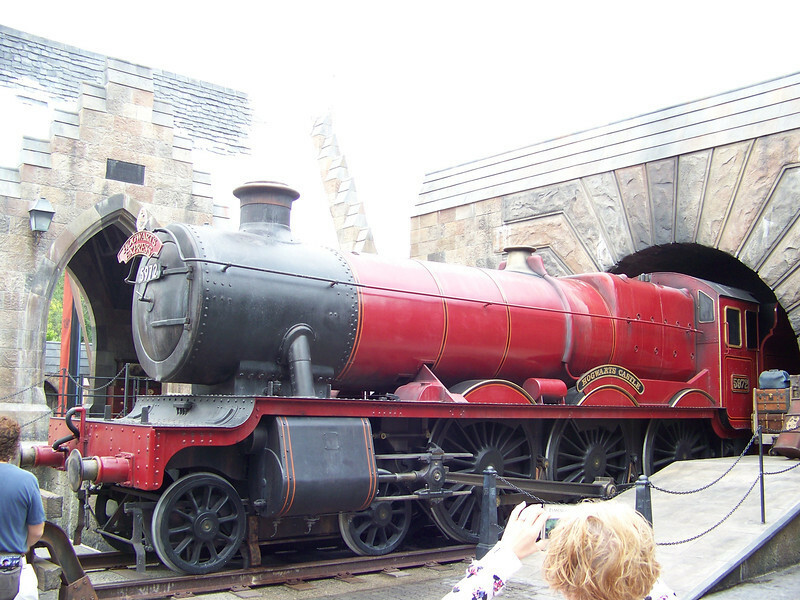 The Hogwarts Express had just pulled into the Hogsmeade station. 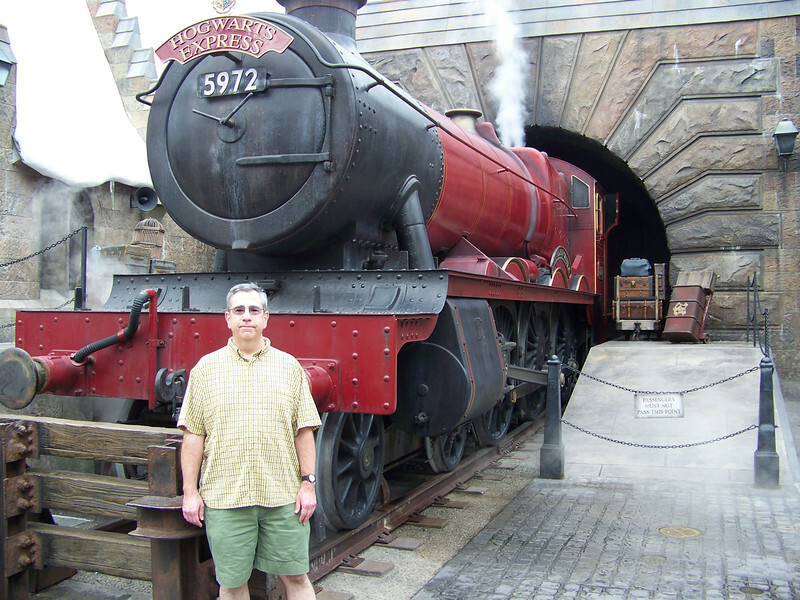 Dave posed with the Hogwarts Express. The train would occasionally chuff and let off steam, but it wasn't a ride at this time--just a photo op. That would change a few years later....! 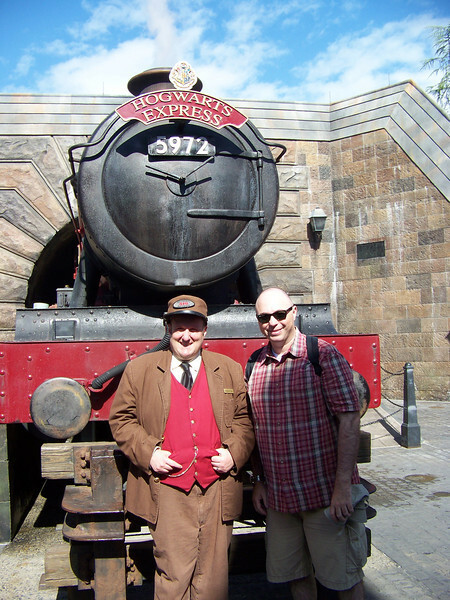 Later in the day, the conductor of the Hogwarts Express posed for a picture with Pat. 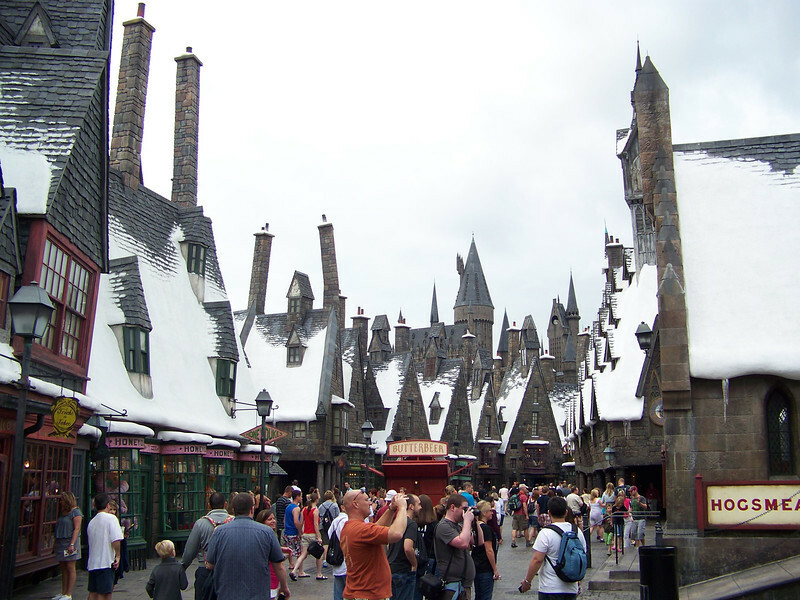 Despite the balmy Florida weather, it was always winter in Hogsmeade. Magic! 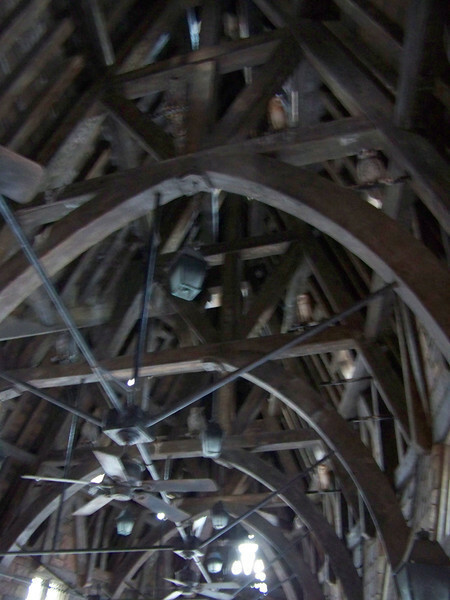 The entire village of Hogsmeade was incredibly detailed. 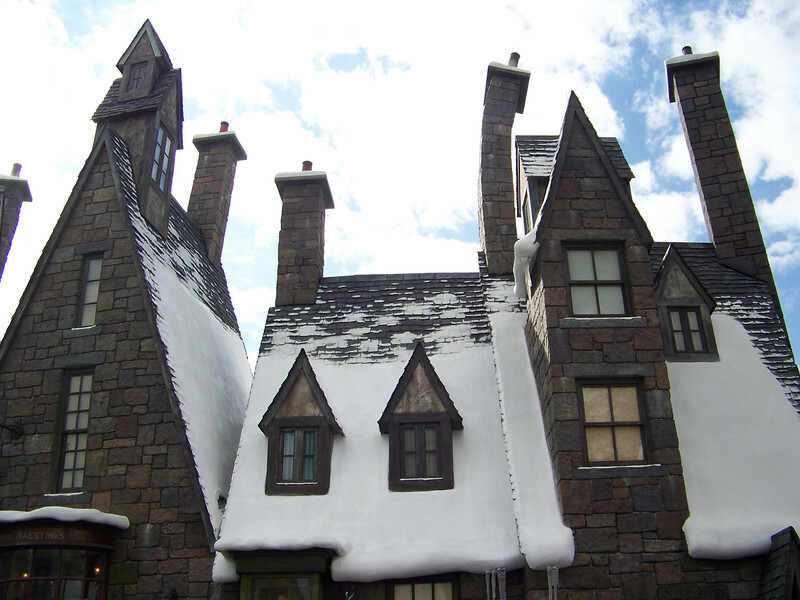 Note how some of the chimneys are askew. 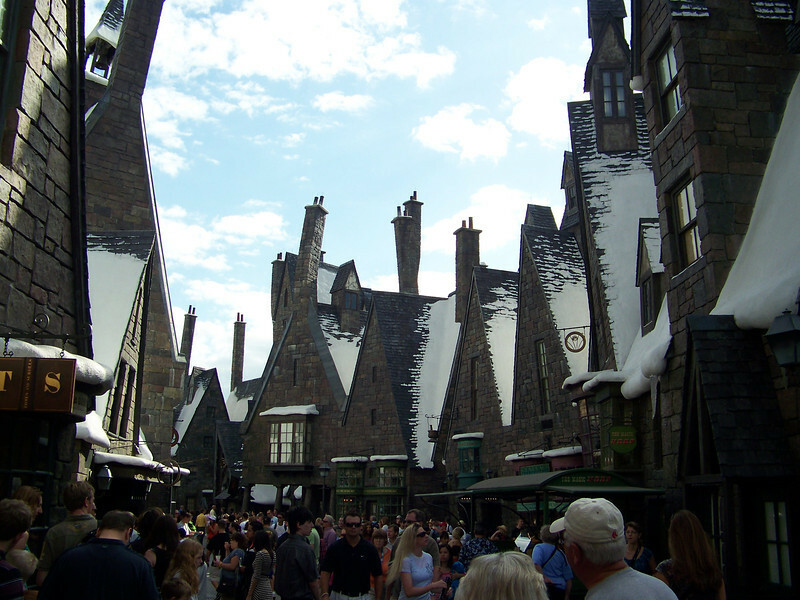 However, Hogsmeade was also incredibly cramped, as you can see by the people crowding the street. All the shops were designed for much lighter crowds than we experienced, and this was nowhere near Orlando's peak tourist season. It must be a nightmare then! 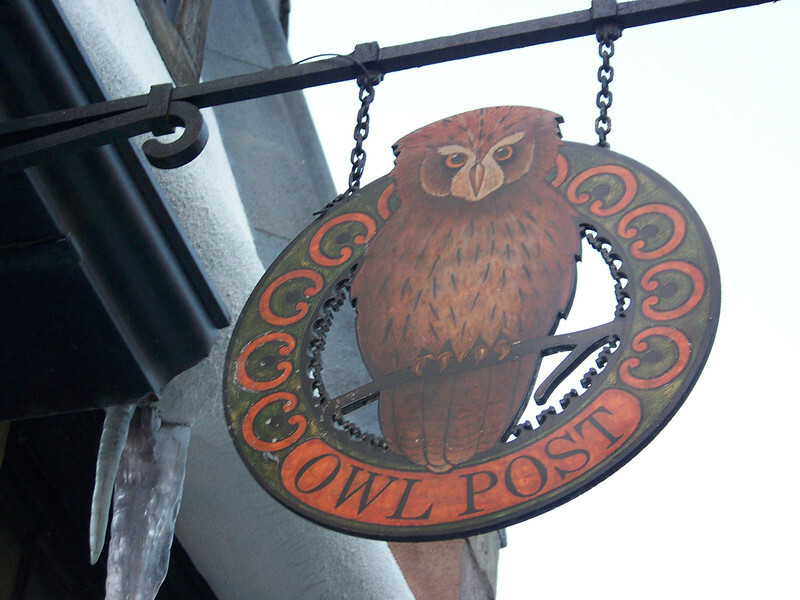 This building is the home of the Owl Post. 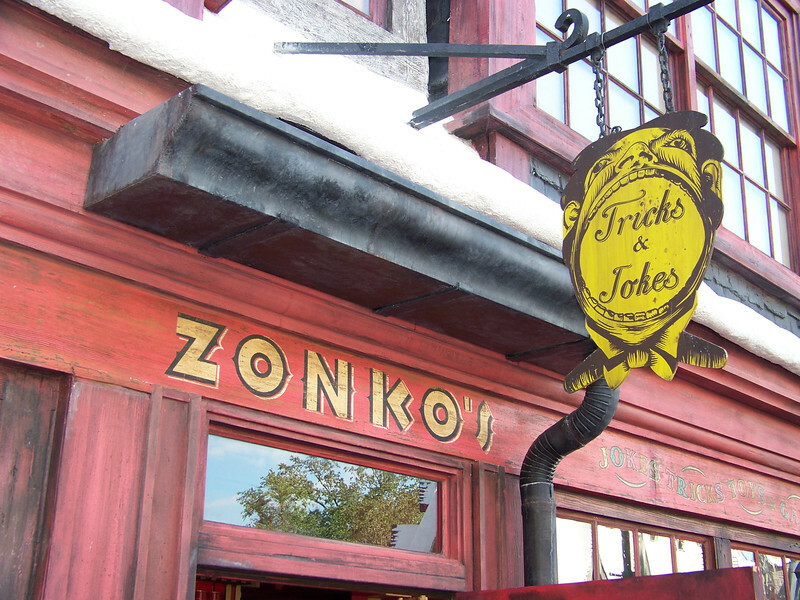 Hogsmeade featured Zonko's Joke Shop. 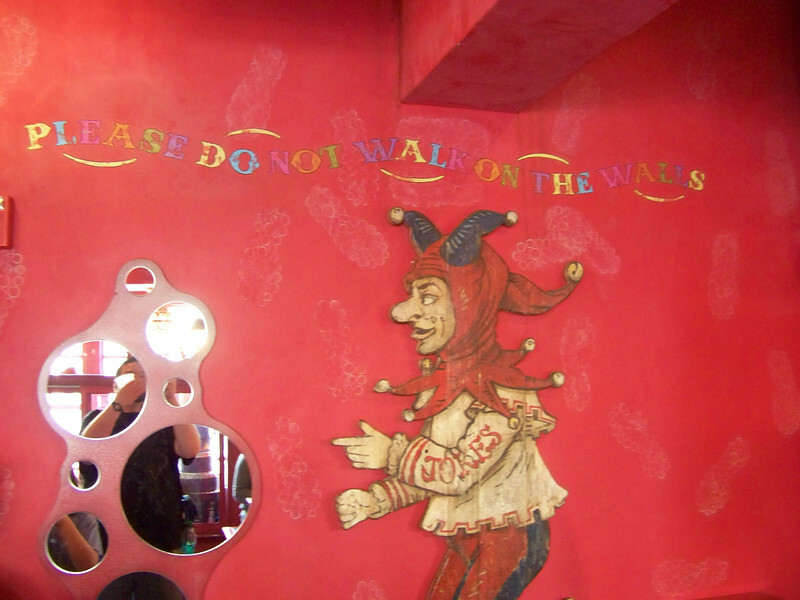 Inside Zonko's, a sign said "Please do not walk on the walls." 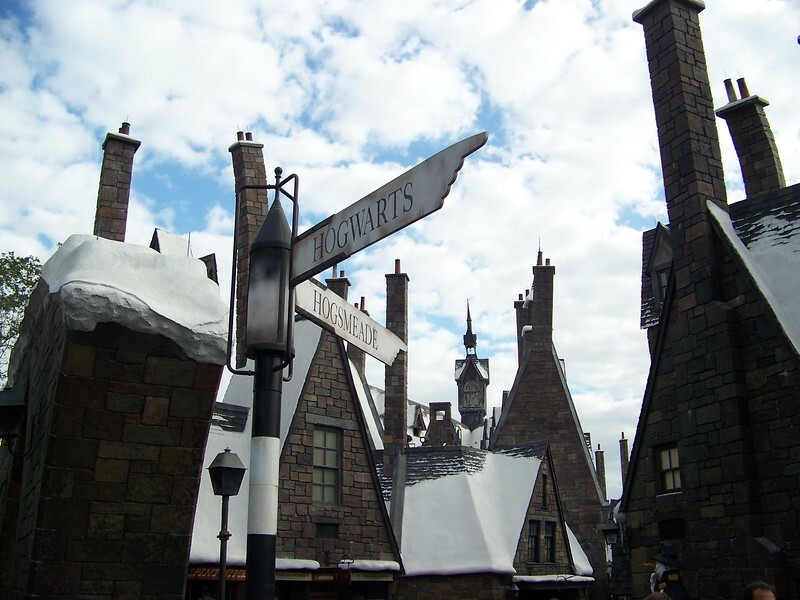 However, you can see by the footprints that not all the wizards have obeyed. 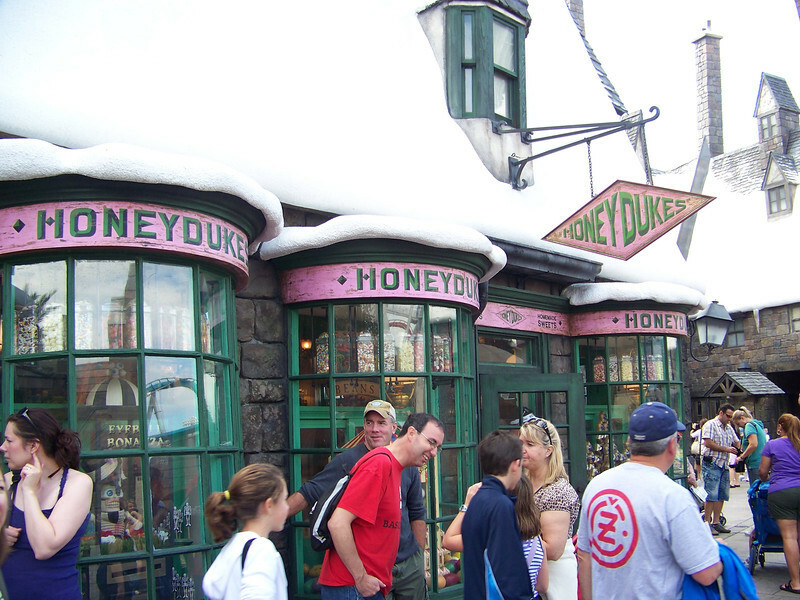 Adjoining Zonko's was Honeydukes, the shop to satisfy every wizard's sweet tooth. 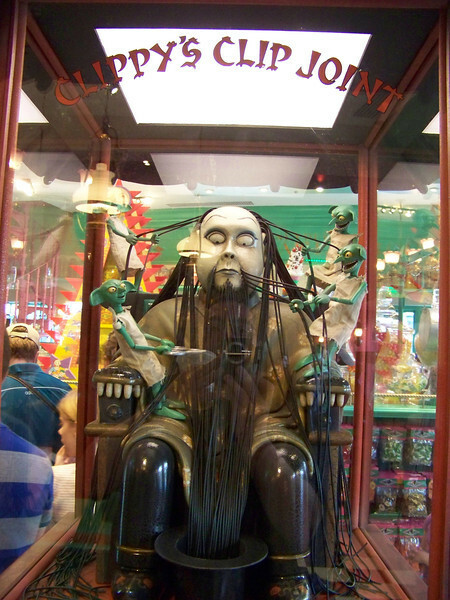 Inside Honeydukes was a glass case called Clippy's Clip Joint. This mechanical man's hair is actually licorice, which the mechanical house-elves were trimming. Care for a bag of the clippings? 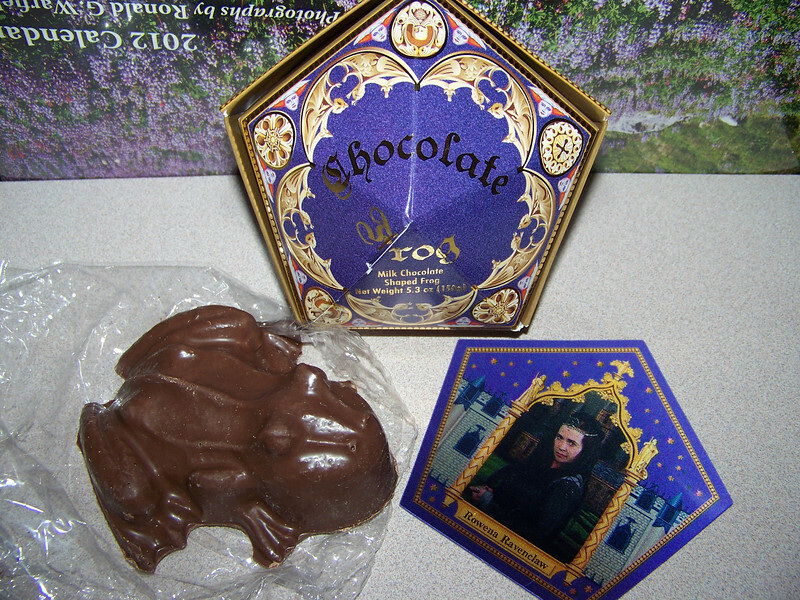 I purchased a Chocolate Frog at Honeydukes. When I got home I opened the box (seen at top). It contained a large frog, which was delicious, but it didn't go hopping about like the ones Harry and Ron bought, darnit! :-) It did include a wizard trading card, and mine featured Rowena Ravenclaw, who was one of the founders of Hogwarts. 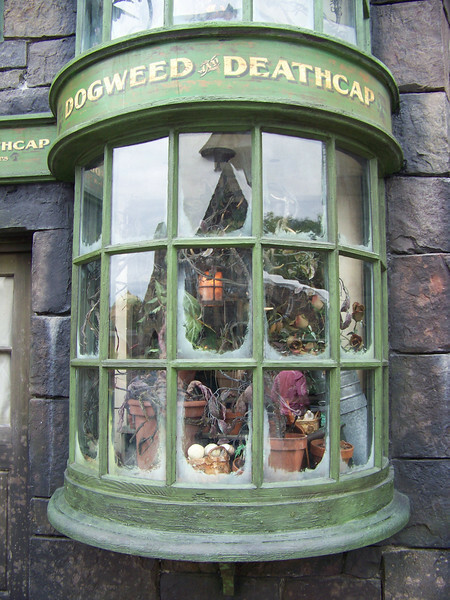 Besides the frogs, Honeydukes also sold all manner of magical sweets like Fizzing Whizbees and Bertie Bott's Every Flavour Beans. 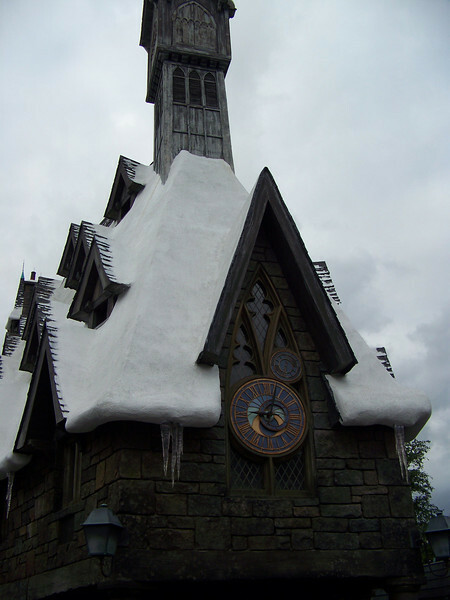 This is the exterior of the Three Broomsticks restaurant in Hogsmeade. 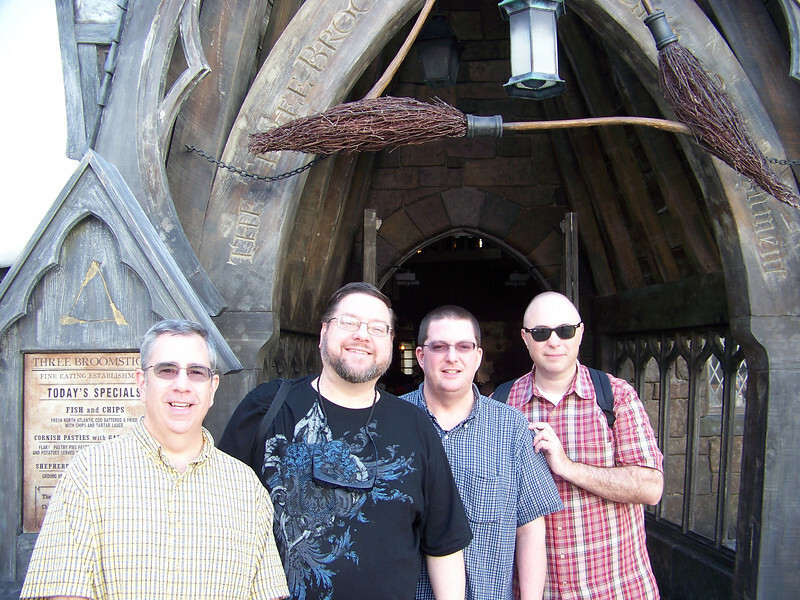 Dave, Jon, Jeff, and Pat at the entrance of the Three Broomsticks. 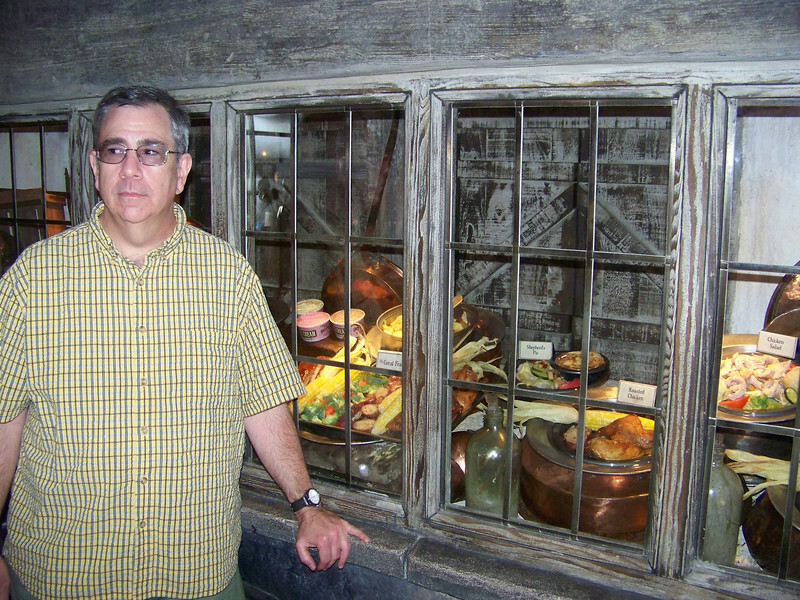 We didn't eat at the Three Broomsticks, but we did pop inside to check out the offerings. Plastic versions of the food you could order were on display in the windows behind Dave. I'd like the Great Feast, please! 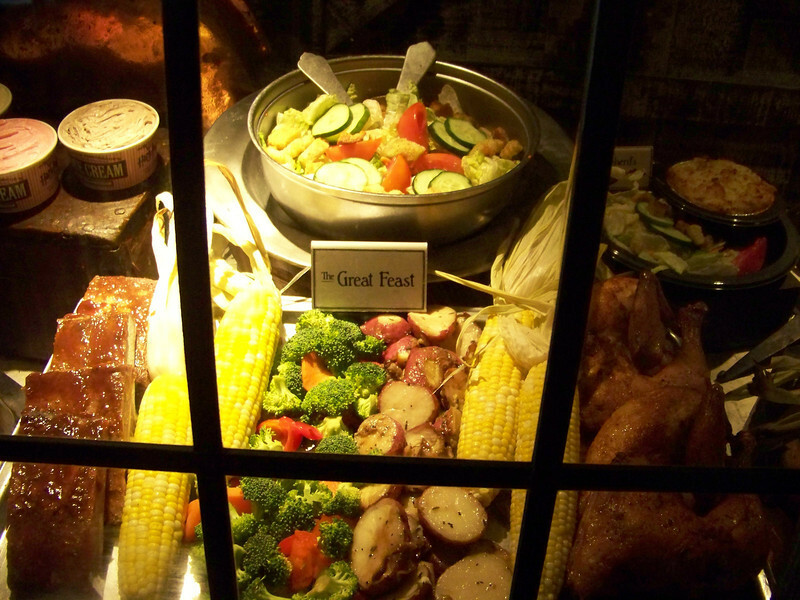 The Three Broomsticks also served appropriately British fare like fish & chips and shepherd's pie. 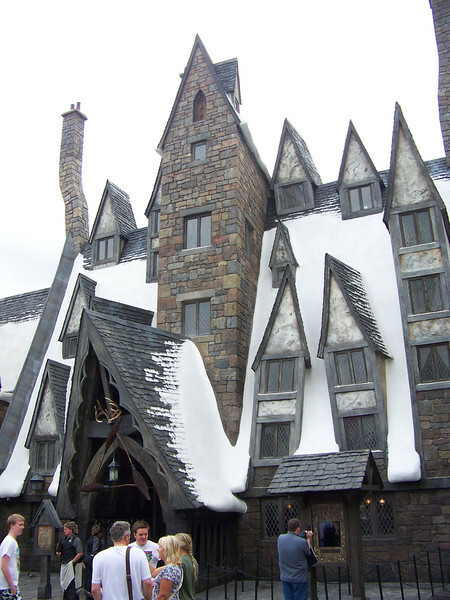 At the rear of the Three Broomsticks was the Hog's Head Tavern. 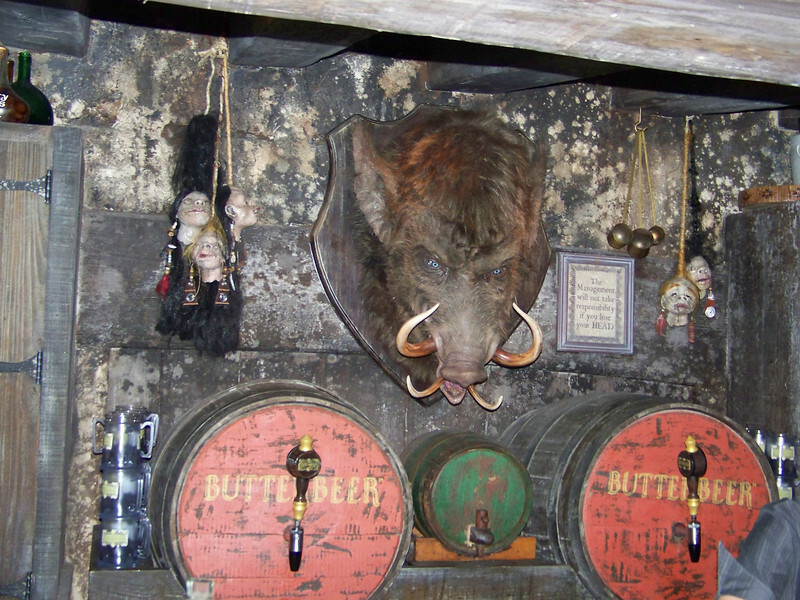 Don't be startled--that mounted boar behind the bar might suddenly roar to life! 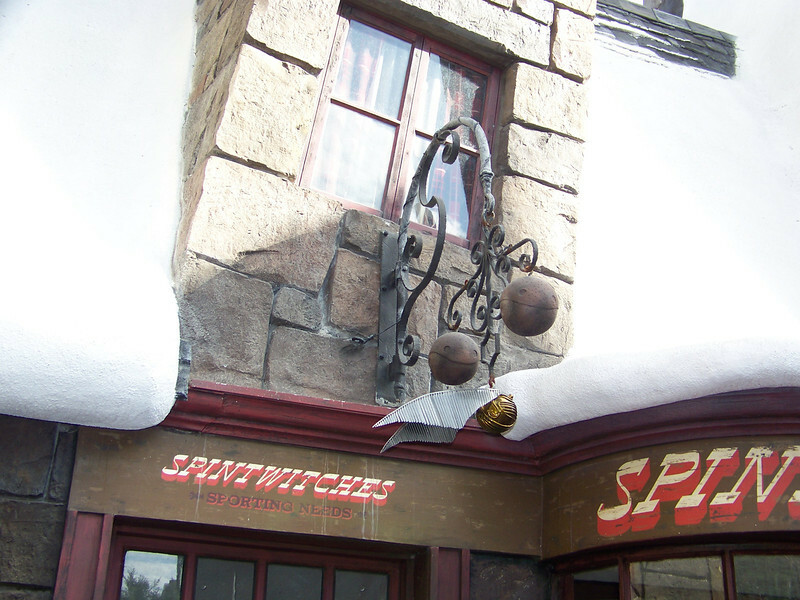 Several "shops" in Hogsmeade were just facades you could look into, but not actually enter. Such was the case with Spintwitches Sporting Needs. Their sign featured a couple of quaffles and an oversized golden snitch. 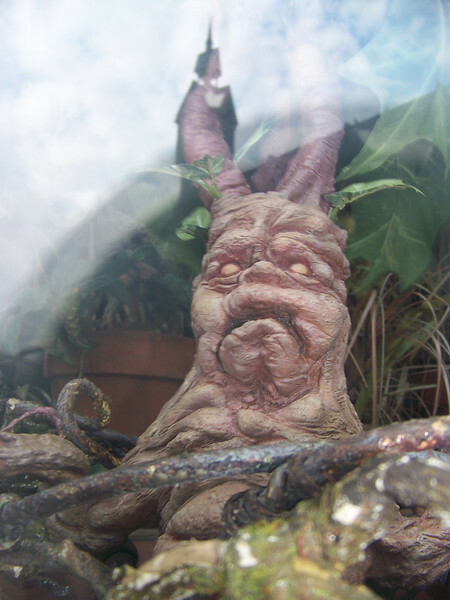 The window display for Dogweed and Deathcap included a mandrake plant. You could hear it screaming through the glass! 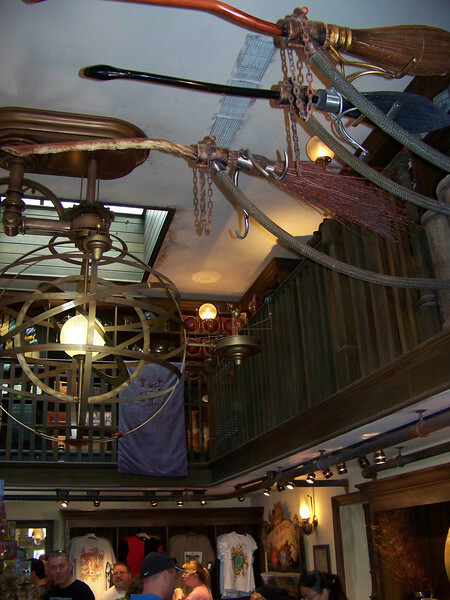 We waited over an hour to enter Ollivanders Wand Shop, where they put on a little show. 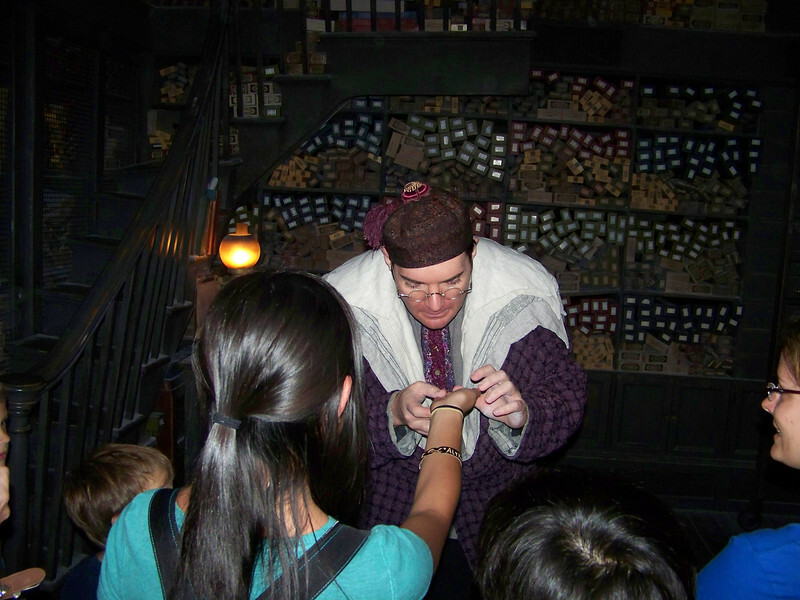 They let in about 15 to 20 people at a time, and then Mr. Ollivander's associate, seen here, helped one random person choose their wand--or more accurately, helped them find the wand that wanted to choose them. Was it worth the wait? Not really. From the descriptions I had read online, I thought this would be more impressive. Of course, if you or someone in your party is the selectee, then that probably makes a difference! I'm parched. 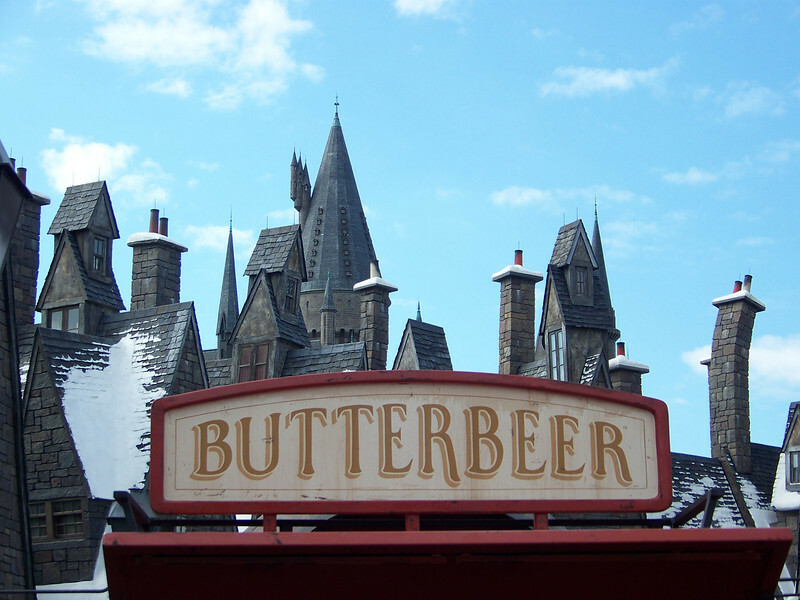 It's time for a butterbeer! 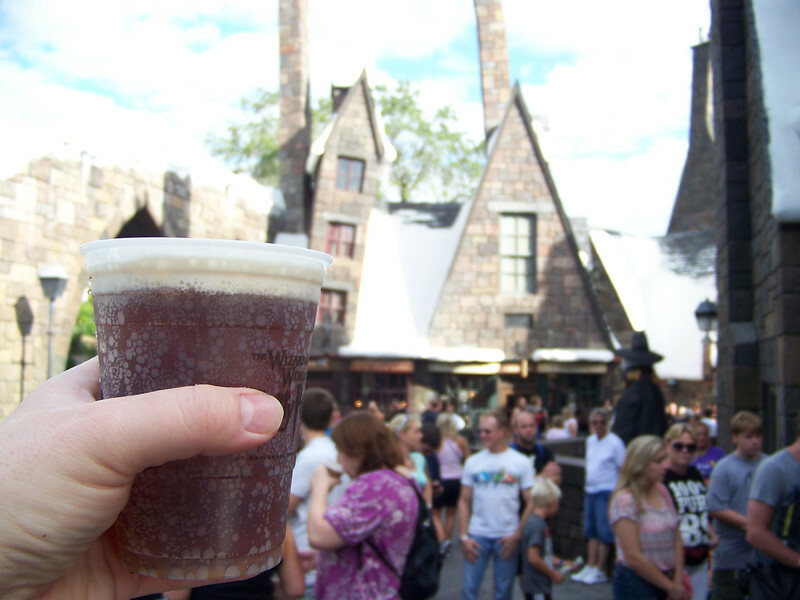 Cheers, Hogsmeade! 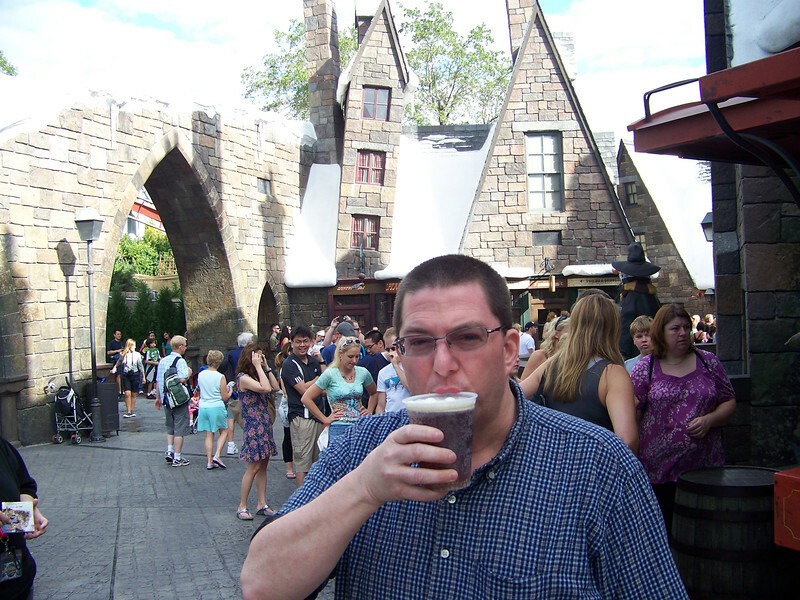 Butterbeer was essentially cream soda, but it had a frothy, creamy foam head on top that tasted like butterscotch. Jeff says yum!!! Butterbeer was good. I wish I could've tried the pumpkin juice they were selling, too! 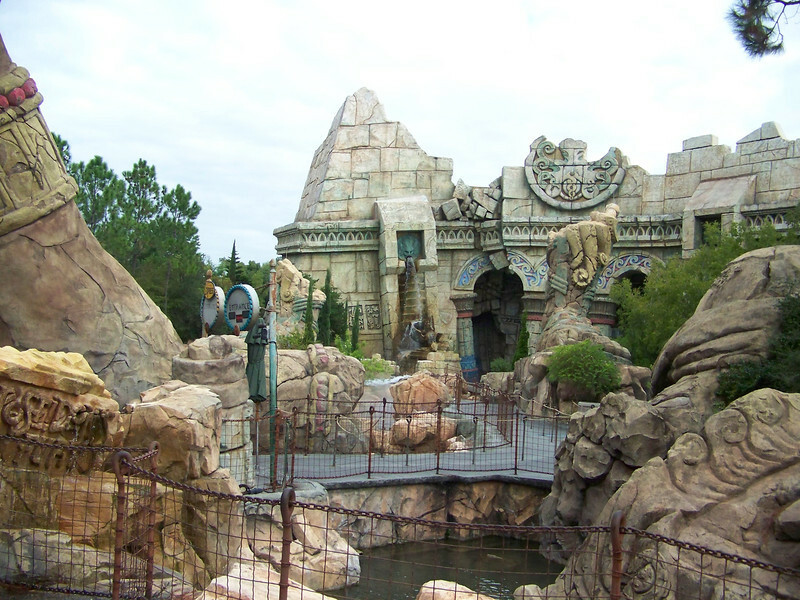 This was one of the re-themed rides that used to be part of The Lost Continent. 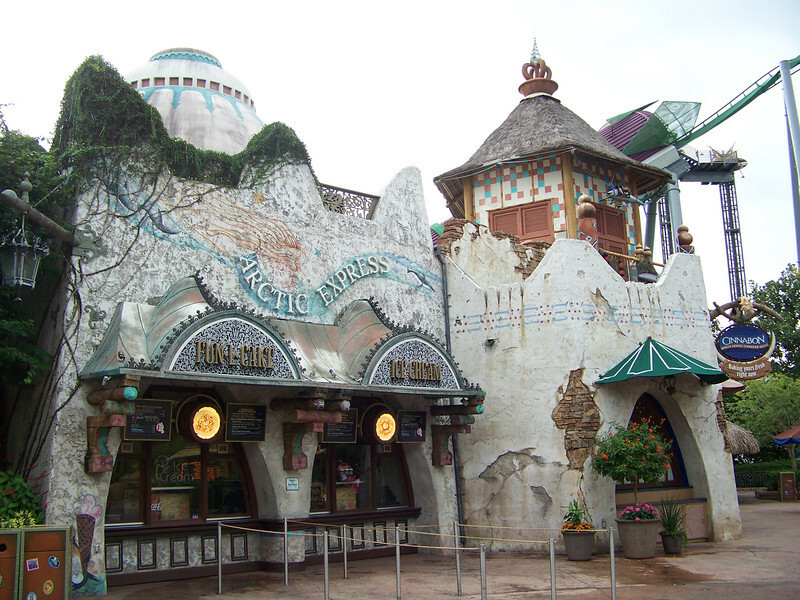 This family-friendly rollercoaster began life as the Flying Unicorn, and we rode it back in 2000. 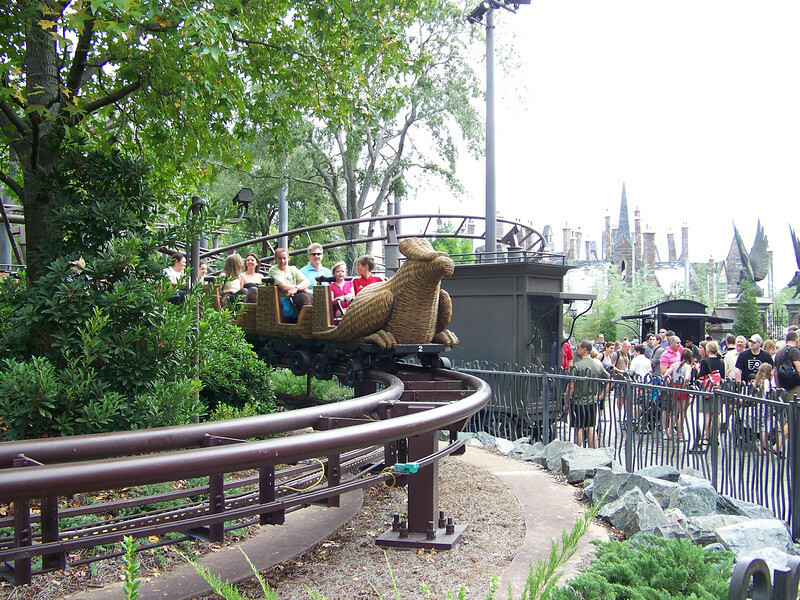 It had been renamed Flight of the Hippogriff. The line was too long so we skipped it this time. 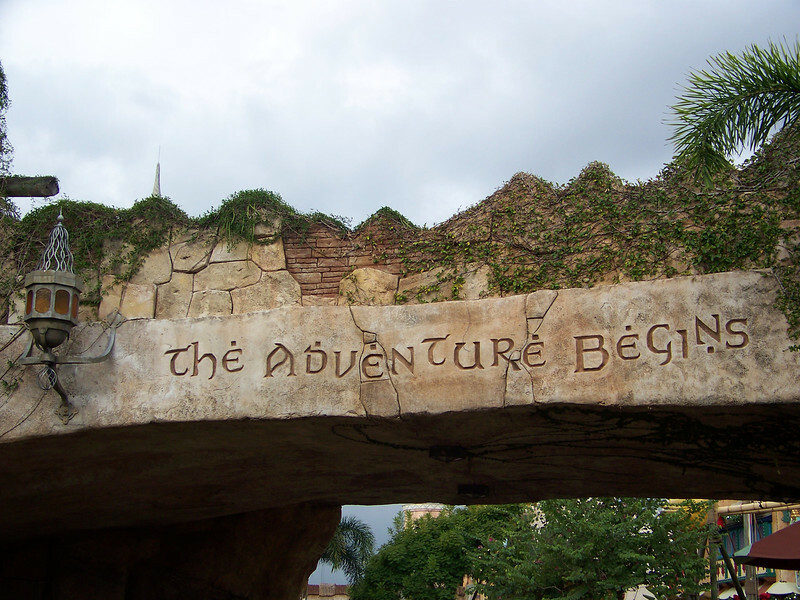 I've read online that they added an animatronic hippogriff which bows to you as the ride begins. For the main attraction here, we followed the signs to Hogwarts itself. 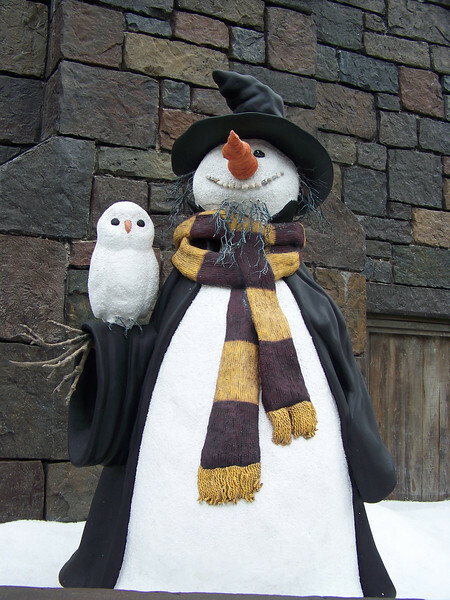 On the way to Hogwarts, we passed this cute snow wizard and his snowy owl.